On the fifth day of Thanksgiving, bring the turkey stock that wouldn’t fit into the ice cube tray to a simmer. Pick the bread out of your leftover stuffing and add what remains to the pot (cremini mushrooms, Italian sausage, fennel and leeks in this case). Add a few sliced carrots. Add a pinch of red pepper flakes. Roughly chop and add the remaining turkey meat. Add a big bunch of swiss chard. Proceed to eat this for the next three days, noting that you really just kicked the leftover can a little further down the road. But hey, at least you worked a little fiber into the equation. 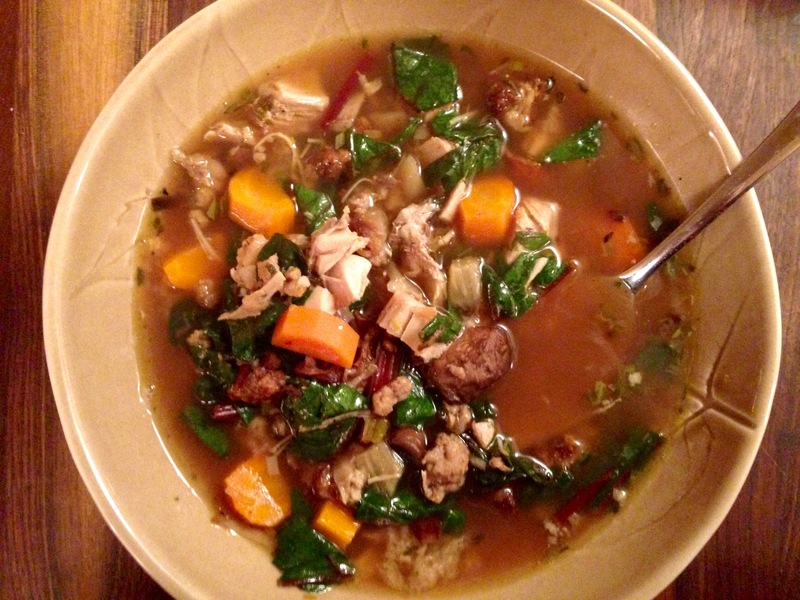 This entry was posted in soups & stews and tagged carrots, chard, fennel, mushrooms, sausage, stock, turkey by Jasmine Nielsen. Bookmark the permalink.